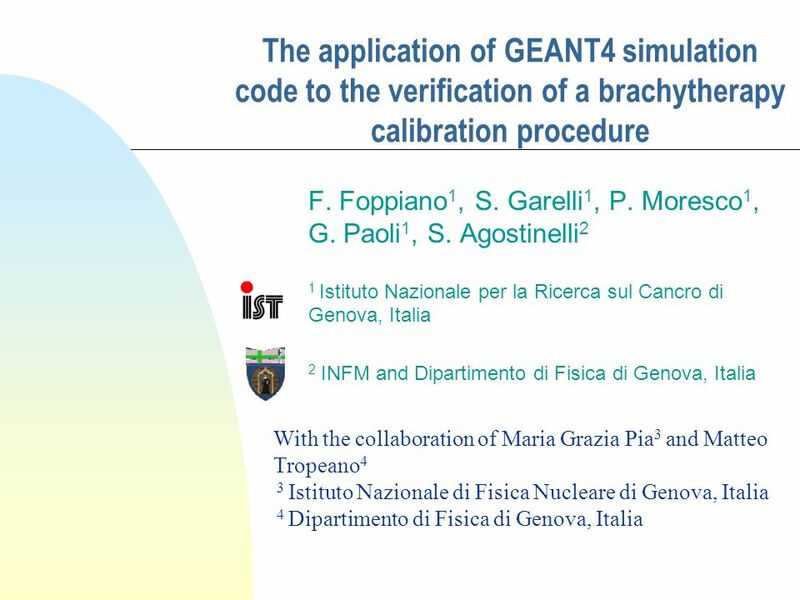 The application of GEANT4 simulation code to the verification of a brachytherapy calibration procedure F. Foppiano 1, S. Garelli 1, P. Moresco 1, G. Paoli. 9 Future developments Geant4 Use of the new Geant4 low energy model Conclusions Simulation of air kerma rate Isodose distribution around shielded and unshielded applicators Geant4 We have developed a procedure to test Geant4 toolkit, which provides a modern Montecarlo implementation and robust physics modelling. 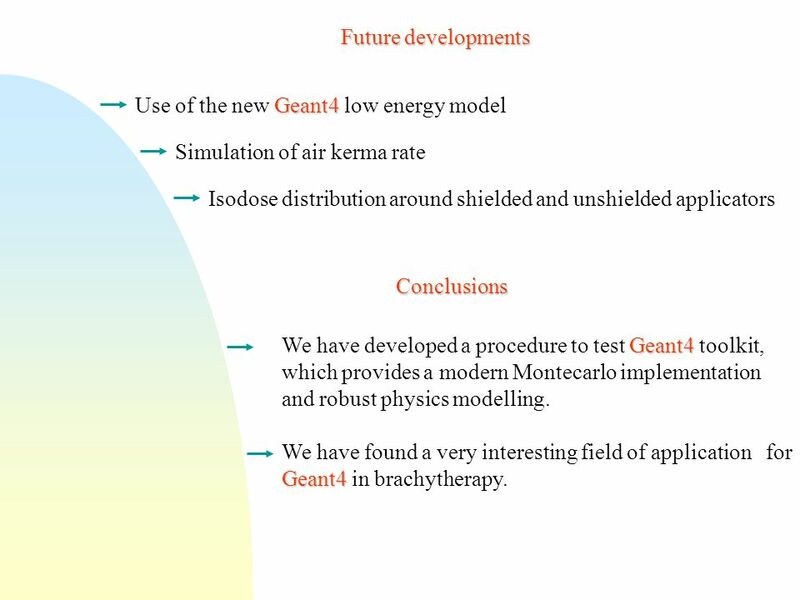 Geant4 We have found a very interesting field of application for Geant4 in brachytherapy. 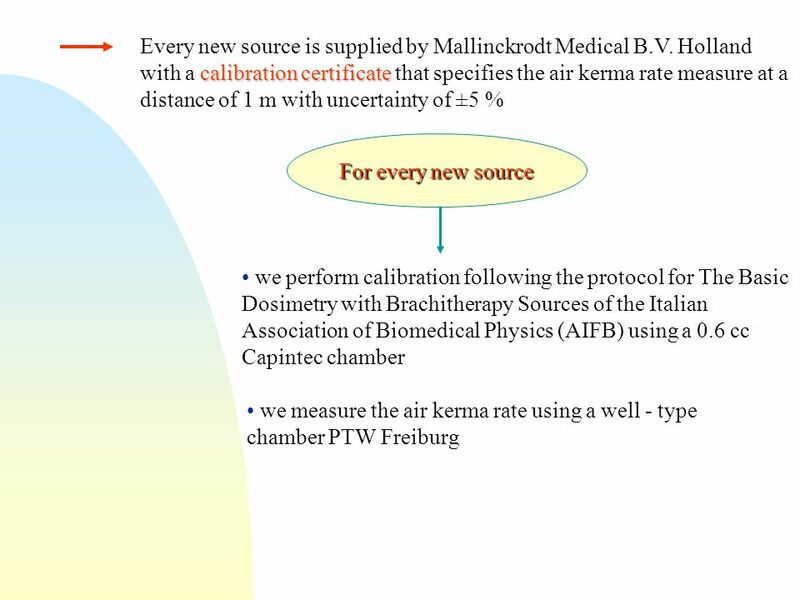 Download ppt "The application of GEANT4 simulation code to the verification of a brachytherapy calibration procedure F. Foppiano 1, S. Garelli 1, P. Moresco 1, G. Paoli." Maria Grazia Pia, INFN Genova 1 Part IV Geant4 results. 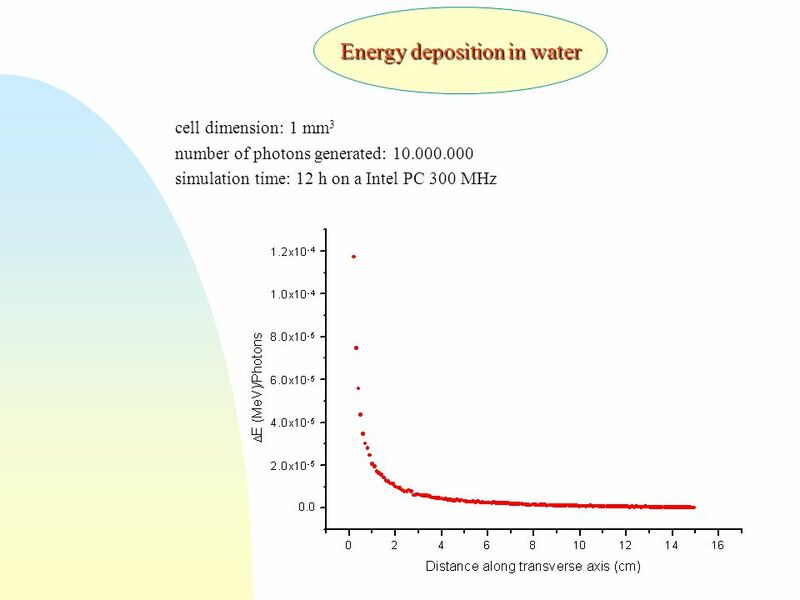 Uniaxial magnetic anisotropy tuned by nanoscale ripple formation: ion-sculpting of Co/Cu(001) thin films R. Moroni Unità INFM di Genova Dipartimento di. 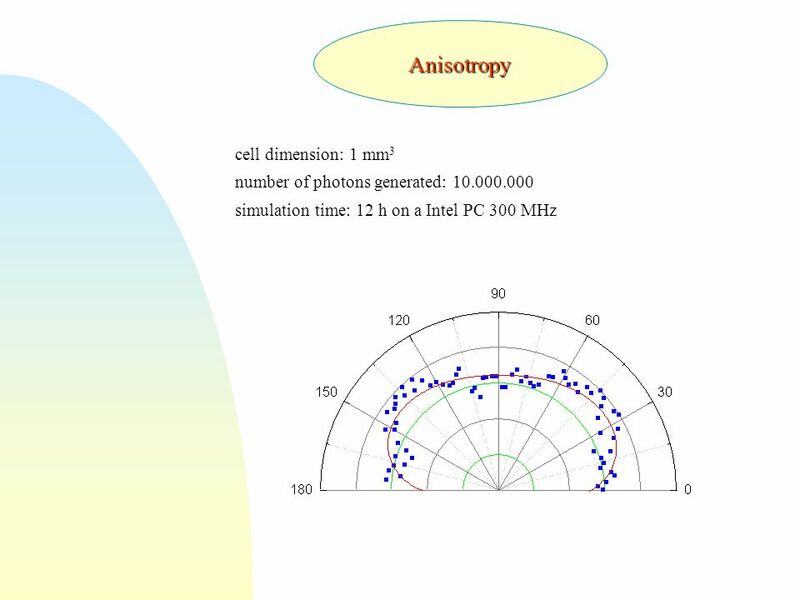 Centro di AdroTerapia e Applicazioni Nucleari Avanzate Project for the development of a protontherapy facility Collaboration between INFN-Laboratori Nazionali. 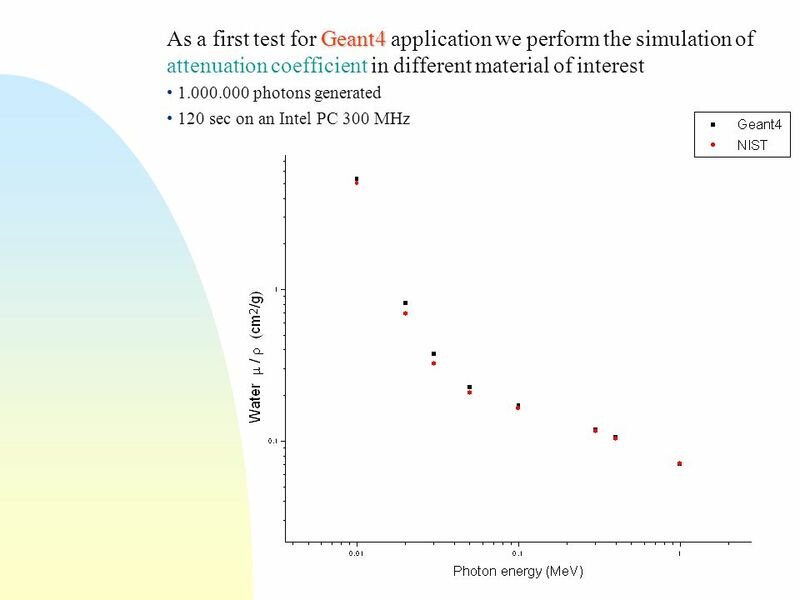 1 COMPARISON BETWEEN PLATO ISODOSE DISTRIBUTION OF A 192 IR SOURCE AND THOSE SIMULATED WITH GEANT4 TOOLKIT F. Foppiano 1, S. Agostinelli 1, S. Garelli. 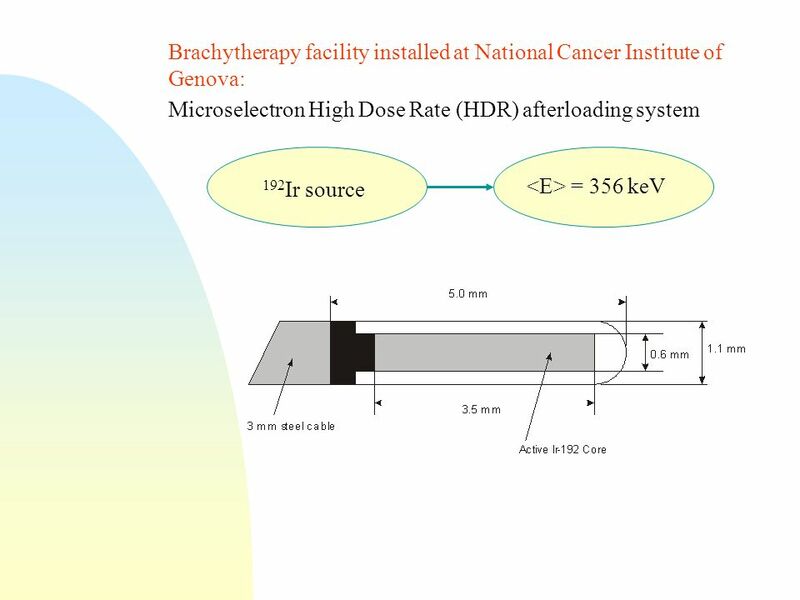 Monte Carlo Based Implementation of an Energy Modulation System for Proton Therapy G.A.P. Cirrone Qualified Medical Physicist PhD Laboratori Nazionali. 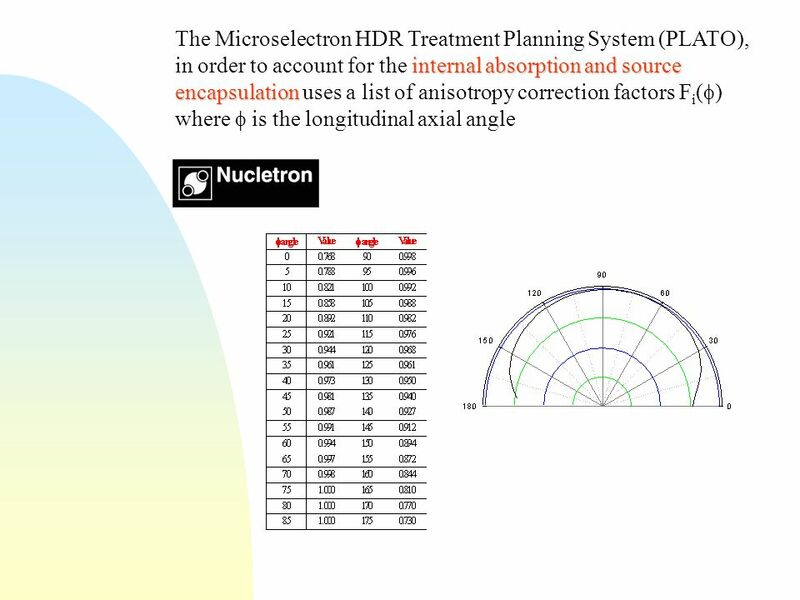 RADIATION PROTECTION IN RADIOTHERAPY Part 10: Optimization of protection in External Beam Radiotherapy PRACTICAL EXERCISE IAEA Post Graduate Educational. Multimodality therapy for rectal cancer Carlo Aschele Oncologia Medica B Istituto Nazionale per la Ricerca sul Cancro - Genova Carlo Aschele Oncologia. Diamond Detectors for Medical Dosimetry Jan U. Würfel, PTW-Freiburg, CARAT Workshop, 13–15 December 2010. 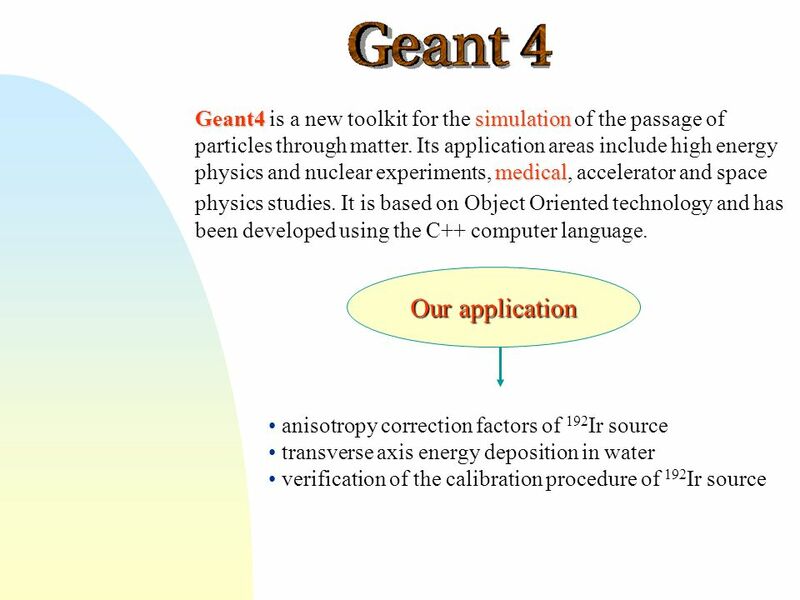 Maria Grazia Pia IEEE Nuclear Science Symposium and Medical Imaging Conference Short Course The Geant4 Simulation Toolkit Sunanda Banerjee (Saha Inst. Villa Olmo, Como 15-19 October 2001F.Giordano1 SiTRD R & D The Silicon-TRD: Beam Test Results M.Brigida a, C.Favuzzi a, P.Fusco a, F.Gargano a, N.Giglietto.